A Pathfinder compatible adventure for 3rd-5th level characters. This adventure will be free on Amazon from 12/22/2012-12/26/2012! Merry Christmas! This adventure is the second in the Rils’ series. It is preceded by the Tomb of Rils. 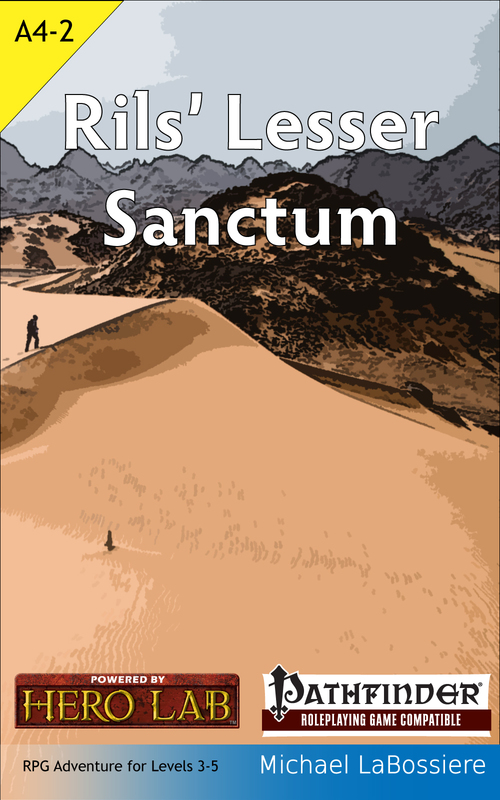 The brave adventurers travel to a desert land in search of the Lesser Sanctum of Rils. There, they will face the dangers of the desert before entering the sanctum. Within its dark chambers, they will face terrible monsters, cunning traps, and one of Rils’ failed students. Those strong enough to survive will leave the desert land laden with treasure and new knowledge. Those that fail shall leave their bones and flesh to the whims of the necromancer. This adventure includes new monsters, new spells and new magic items.